The agent and his colleague was stripping my faithful car! After sixteen long years, it is difficult to part with my dear old car. She served out her years faithfully and was my constant companion on many lonely roads. While she may still have a few more good years in her, in the last few months she was coughing and spluttering – too often – and the visits to the car clinic became more frequent. I know I must have a more dependable car, especially when I’m often out at events and various locations, sometimes until late hours and I can’t be bothering my mechanic – even though he’s already on my speed-dial! In October, I decided to retire my old car. Besides choosing a new car which, I believe, should have fewer problems, I also wanted to upgrade to a 4-door car. That’s because mum and dad are driving less now and it is quite a challenge for one of them to climb into the backseat of my 3-door car. Now at age 80 and 90, it is only a matter of time before both of them would give up driving and I need to be ready to ferry them more conveniently. So I started the search for a suitable 4-door car and went around test-driving the various recommended car brands and models. Innovative and economical way to keep air vents open! 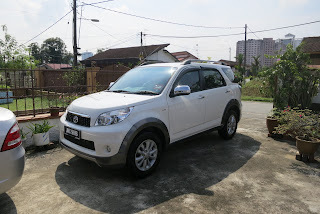 When I made my car choice, the agent told me that he could only say when it can be delivered next month. So on Nov 1, he said that it should be delivered around Nov 22 or 23. I know that Nov 22 is a Public Holiday so I anticipated its delivery a bit later. On Nov 26, the agent turned up with another colleague as he was going to take my car away. While it was a swift and smooth procedure, I thought it was a rather abrupt ending to my long relationship to my faithful car. First time in the driveway! I know it’s good to make a “clean break” rather than to linger and let the wound hurt more but whether it was quick or slow, it is still painful to part with my old car. While the agent was discussing details of the new car with me, his colleague was removing all my personal items and stripping the car of its identity. When I realised what he was doing, I could not help being overwhelmed by painful pangs of grief! She may just be a car – a vehicle for transport – but it’s much more personal to me. As all the little knick-knacks were handed back to me, the lump in my throat was growing larger and I was going to be embarrassed if I could not hold it down. I must admit that it was an enormous challenge to continue speaking to the agent with a straight face while I was ready to crumble at any moment but I barely managed it. Out for the first spin with senior citizens! I made a final check to ensure that there was no other personal item left inside and then I spotted the bumper sticker – a precious gift from Uncle Charles – and I asked the agent to remove it for me. He realised that it is special but hesitated to touch it, saying that it looked (old and) fragile and was afraid to damage it. I assured him that it cannot be damaged because it was laminated and he could just peel it off gently. He did so gingerly and handed it back to me. 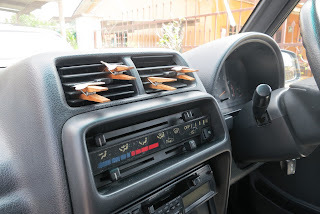 When I peeked inside and saw the series of clothes pegs I clipped on the air-con air vents, I cannot help but smiled at my innovative and economical way to keep the vents open. Passengers who saw the pegs in my car were both curious and amused probably because they agreed that the pegs were functional and also part of my name! I’m certainly missing my good old car and its crankiness but as a consolation, I have the pleasure of driving a new car. 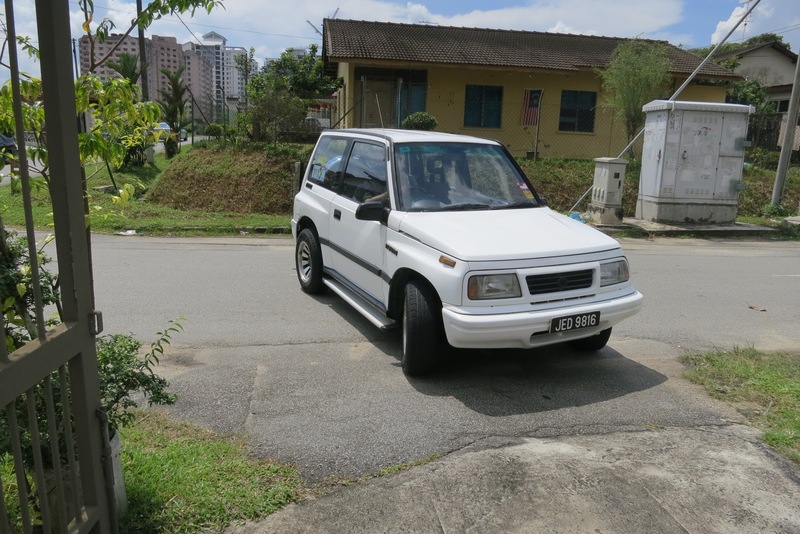 When she was delivered, mum said that it’s as if my old car has “grown up” because at a glance, she just looks like a bigger version of my previous car. I guess it’s also because I’m dressing her up and giving her the same identity but without the pegs! 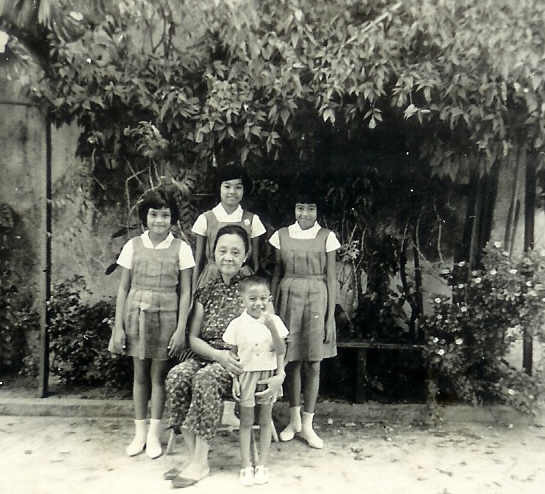 Ramlah Mohamed, 82, fondly known as Auntie Rom, was the first Malay lady to run a Convent school in Malaya in 1955. She started the Convent Batu Pahat and ran it for 28 years and from 1983 till her retirement in 1986, she was principal of Convent Primary Johor Baru. Looking back on my career with the Convent, I’m so proud of all the students and teachers who started the school with me from a small shed and storeroom at Jalan Tan Swee Hoe in Batu Pahat. While the school building was under construction, I used to commute daily from my lodgings at the Batu Pahat Rest House and still shudder when I recall how I avoided the drunken soldiers who would enjoy their drinks there every night. As soon as the school building was ready, I got permission to live in one of the classrooms for three months, even while the electricity supply was not connected yet. Living with the bare essentials is nothing new to me because I was the second of three daughters, born in a humble home in our kampong in Bakri in 1930. Both my sisters died young and I grew up as an only child with a strict upbringing under the care of my aunt and uncle in the kampong. 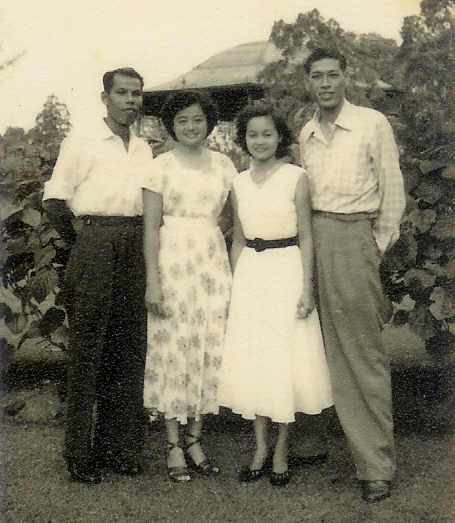 During the Japanese Occupation, we evacuated to Parit Sulong near Air Hitam and even though we lived a relatively comfortable life here, I cannot forget the horrifying sight of human heads hung in a row, a grim warning by the Anti-Japanese Movement to those who worked with the invading Japanese. 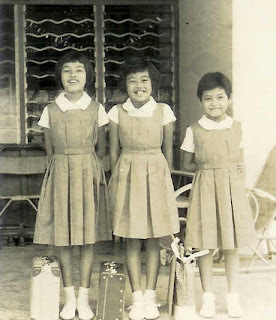 I started my education with the Muar Convent that had 5 classrooms in a big house but stopped school when war broke out. My father was a friend of Father Renee Ashness, a Catholic priest and used to have dinner at the priest’s house along with Dr Hassan Mohamed, a dentist with the Muar Hospital. At one such dinner, Fr Ashness suggested to my father that I join the Malacca Convent in Bandar Hilir that offered student boarding. 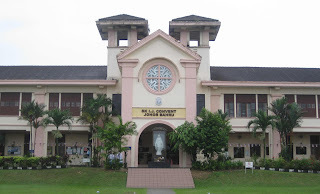 After losing 3 years of education due to the war, I joined the Malacca Convent in Standard 4 and over the next 6 years, I was moulded under the strict discipline of Irish nuns. For instance during meals, we started to eat and stopped eating at the sound of a bell and by that time, we should finish all that was provided on the plate. We washed our own underwear and in the evening, those who forgot to collect them from the clothesline would see them piled up in the school hall. I remember how Sister Saint Finbar would lift up each piece with a long stick and as the careless culprits were too embarrassed to own up and face punishment, the unclaimed underwear were given away to a girls’ orphanage! My father was sickly after suffering a heart attack and he wrote to Reverend Mother Martha, requesting to take me out of the Convent but Reverend Mother, who was a mentor and a mother to me, replied telling him that he can “Pay When Able” and I will not leave the school until after I completed my Senior Cambridge exams. One of my fondest memories of the Convent was how Sister Saint Bernadette organized my 21st birthday party in the school hall, complete with birthday cake, flowers, chocolates, gifts, dancing and singing. Father sent me a wrist-watch which the nuns gift-wrapped to present to me and I can still picture the entire scene, feeling overwhelmed with emotion because I had never celebrated my birthday before! In those days when we did not have the convenience of a car or telephone, Reverend Mother Margaret Mary and I went about on a trishaw, to meet the District Officer and others officers to get them as references and obtain their signatures on the forms. I remember going for the interview in Johor Baru and one of the questions asked was, “What is your hobby?” to which I replied, “Cooking.” When asked to describe how to cook sambal tumis udang (prawn sambal), I explained the step-by-step use of ingredients and was pleasantly surprised to be interrupted by an English lady on the panel who enquired, “Don’t you put in assam jawa?” because she was also familiar with the recipe! The list of successful candidates to go to Kirkby was published in the newspapers and while my friends’ names were printed there, mine was not. Just 3 weeks before the departure date, I attend a Malacca Convent anniversary lunch and here, Reverend Mother Martha handed me an envelope with my acceptance documents into Kirkby! They had tried sending it to me through all the Convents in Malaya except to Muar Convent, where I was, and redirected it to Malacca Convent where I finally received it! I did not have any passport or suitable clothes but Reverend Mother Martha gave me a used coat that was warm enough for me, 1 dozen ‘Pyramid’ brand handkerchiefs, toiletries and RM100 cash. Through the guidance and kindness of these nuns, I was among the second batch of Kirkbyites who had two wonderful years of well-rounded, life-long educational experiences in Kirkby College. 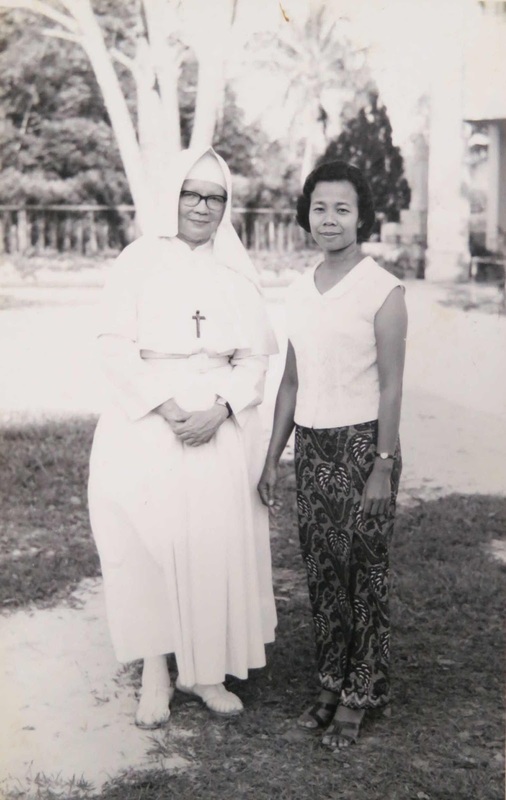 Two weeks before I was due to return to Malaya, Reverend Mother Martha arranged for me to go on a holiday to Ireland and meet with Sister St Finbar at Drishane – the institute for Infant Jesus Sisters in Millstreet, Cork. Three months after my return from England, Reverend Mother Martha would pick me from Muar Convent on Friday and cross the Muar River by ferry to go to Batu Pahat where we usually sat on a log at the school site, to have tea. After she told me that Batu Pahat Convent needed a qualified teacher, I took the challenge to run the school that started with 68 children and developed the school over the next 28 years. It is my privilege to have a treasure trove of memories with the nuns who guided me from childhood to adulthood and I’m ever grateful for the uncompromised Convent standards of training that moulded me into who I am. Cahaya Jauhar Sdn Bhd was proud to receive the Best Tourism Website award for Kota Iskandar under the Marketing & Media category at the second Johor Tourism Awards event on Oct 24 and being recognized among some of the most hardworking and outstanding stakeholders in the Johor tourism industry. Its Chief Executive, Mohd Auzir Mohd Tahir, was thrilled that their website: www.kotaiskandar.com, created with teaser elements that highlighted Johor’s rich culture and heritage, worked effectively to entice visitors to visit Kota Iskandar as a tourism destination. 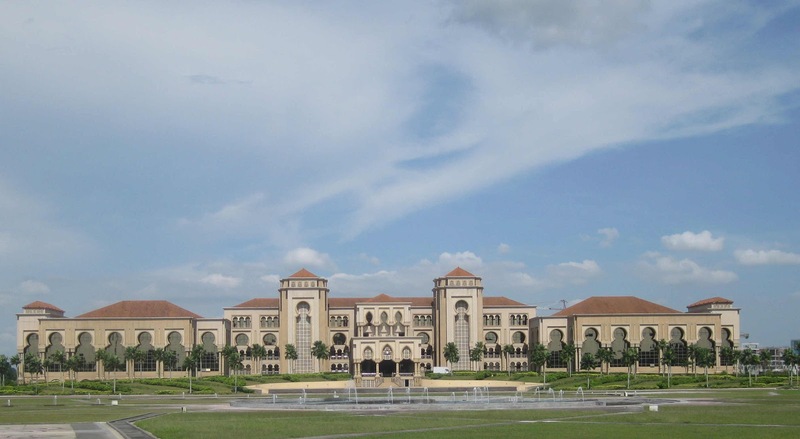 Cahaya Jauhar, a joint-venture between the Johor State Government and UEM Land, is the master developer of Nusajaya, entrusted with the development of Kota Iskandar. Happy with the proud achievement for their website, Mohd Auzir and his team were pleasantly surprised when Cahaya Jauhar was further rewarded with the prestigious Special Award in recognition of its contribution to Johor’s tourism industry. This recognition for its role in promoting Johor’s culture and heritage in Kota Iskandar is proof that the award-winning Cahaya Jauhar is certainly more than just a developer. “The idea to develop Kota Iskandar into a tourism destination was mooted by Johor Menteri Besar Dato’ Abdul Ghani Othman and Minister for Tourism, Dato’ Seri Dr Ng Yen Yen during her visit in 2010,” said Mohd Auzir. 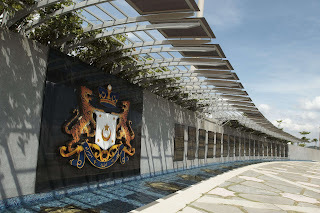 In subsequent months, Cahaya Jauhar carried out several initiatives like developing its website that was skewered towards tourism, worked with local consultants to present Kota Iskandar not just as an administrative centre but one of Johor’s top ten tourism icons and teamed up with Iskandar Regional Development Authority (IRDA) to train a team of 80 tourist guides. In April 2011, Kota Iskandar guided tours and the tourism website was officially launched by Datuk Hoo Seong Chang, Johor Tourism, Domestic Trade & Consumer Affairs Committee chairman. 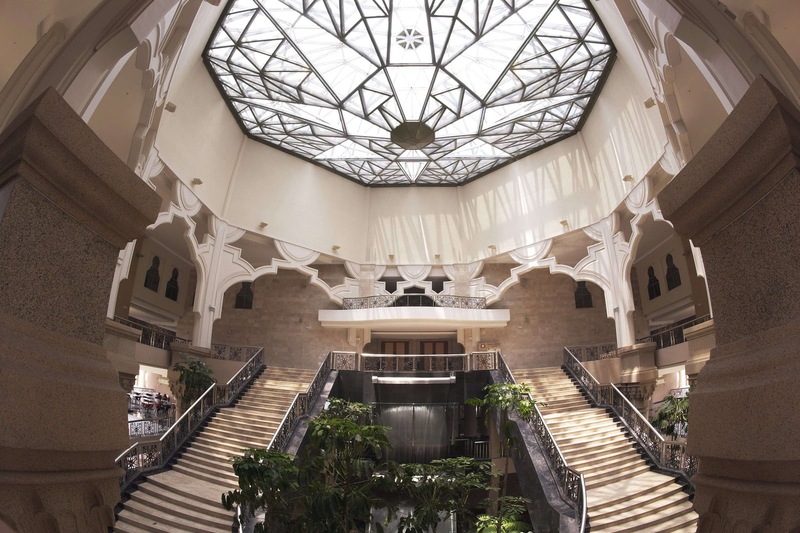 Since 2007 Cahaya Jauhar has been recognized both locally and abroad, with quality and excellence awards for Property, Construction and Landscape. In 2012, Cahaya Jauhar was honoured with 4 awards, making a total of 9 awards to its reputation thus far. 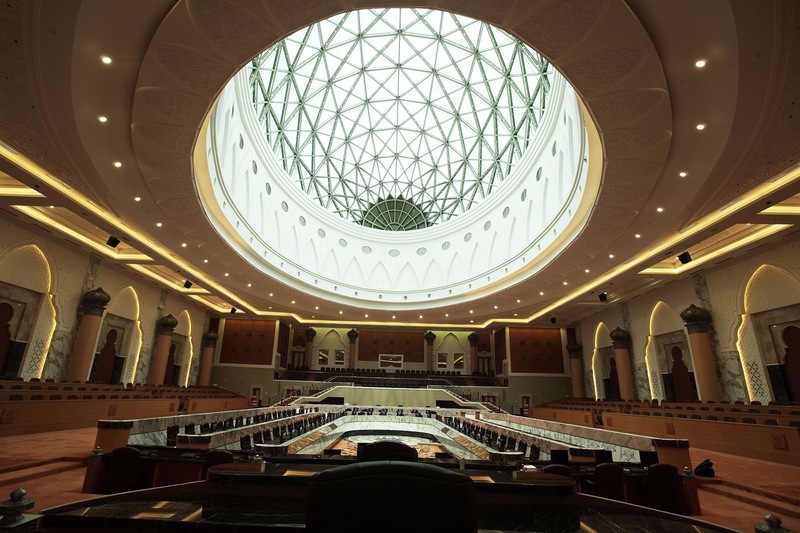 When Mohd Auzir heard a FIABCI official comment, “You run a Government project like a private property,” he accepted it as a compliment. 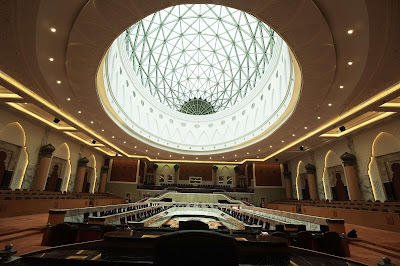 Kota Iskandar is an award-winning destination that can claim several “firsts.” It is the first destination in Malaysia that offers visitors a tour of the State parliamentary assembly hall and even opportunities to attend the assembly sittings. While the security presence may not be visible, Kota Iskandar boasts of the first integrated, non-intrusive security plan in Malaysia. It also has the first fully-integrated, non-intrusive waste collection system in the nation and the first district cooling system outside the Klang Valley. In the 2012 Singapore Design Awards, Cahaya Jauhar was honoured with the Silver Medal in the Branding Category. This is indeed a prestigious award as Kota Iskandar was a first-time participant and pitched against Regional and International nominees. Branded as, “Johor’s living legacy, cherished by all,” Kota Iskandar has positioned itself as a destination to be appreciated by all levels of society. “Bangunan Sultan Ismail or BSI building is a key component of Kota Iskandar,” said Abdul Rashid Mammod, Cahaya Jauhur’s Customer Relations Executive, who is instrumental in training the tour guides and leading insightful tours in Kota Iskandar. “Visitors are welcome in enter BSI and visit the Siar Jauhar Gallery that is filled with interesting exhibits on Johor’s culture and heritage,” he added. He emphasized that this public gallery has comprehensive and informative displays and there is no entrance fee. My first encounter with Professor Datin Paduka Dr Jamilah Ariffin, the wife of Johor Menteri Besar Dato’ Abdul Ghani Othman, was on the stage of Dewan Sultan Iskandar in Universiti Teknologi Malaysia (UTM) as she presented me with my certificate in a convocation ceremony in 1995. At that time, Dato’ Abdul Ghani was just appointed as the 14th Menteri Besar of Johor and they had relocated to Johor Baru. 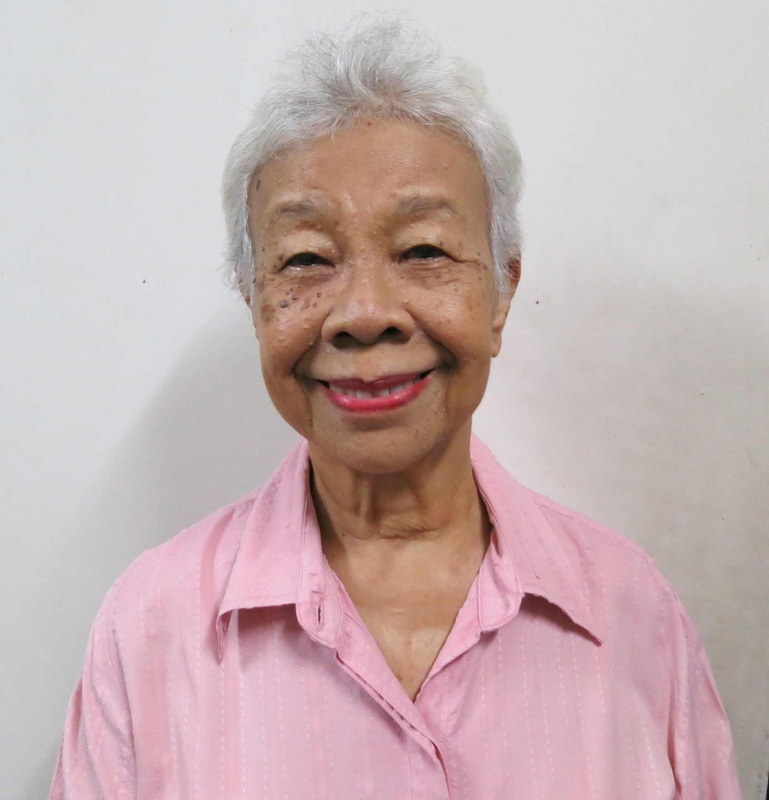 Since 1975 Prof Jamilah was a lecturer with Universiti Kebangsaan Malaysia before joining University Malaya as a professor and when they moved to Johor Baru, she was transferred to UTM. I know she is an academician and from various reports, I learnt that she was the first Malaysian to be elected to the prestigious Swiss Academy of Development, a council of prominent professors in Europe. She was also the leading consultant representing the Malaysian Government in the UN Beijing Women’s World Conference in China in 1995 that resulted in the report entitled, “The Status of Women in Malaysia.” It is significant that Prof Jamilah was among a small group of women involved in creating the first draft of “Women and Development” for the Sixth Malaysian Plan and actively lobbied for the Women chapter to be included in the Sixth Malaysia Plan, that established the Department of Women’s Affairs and led to the formation of the Ministry of Women, Family and Community Development. Our paths crossed again in 2002 when a mutual friend asked me to meet her in Saujana, the Menteri Besar’s official residence, for an interview to join her team. At that time, Prof Jamilah was recently appointed as President of Asia Pacific Forum on Families (APFAM) International, an international Non-Governmental Organization (NGO) and a United Nations recognized regional voluntary organization, a post that she held for the next 10 years. In this capacity, Prof Jamilah represents 12 member countries in the Asia Pacific region to develop policies and activities that promote the well-being of families and individuals in the Asia Pacific Region. The Malaysian chapter of APFAM was formed in 1999 and the Johor Family Development Foundation was established as a Johor State Government Statutory Department to implement projects and programmes that strengthen the family institution and address social problems that affect women. This is a subject close to my heart and since I could help Prof Jamilah to compile academic papers for a book publication and coordinate the organization of an APFAM International conference in Kuala Lumpur, I joined the team. And as I worked behind the scenes in her home office in Saujana, I had the privilege to get to know Prof Jamilah better. Very few people are aware that Prof Jamilah excelled both academically and in her professional work with the various universities. 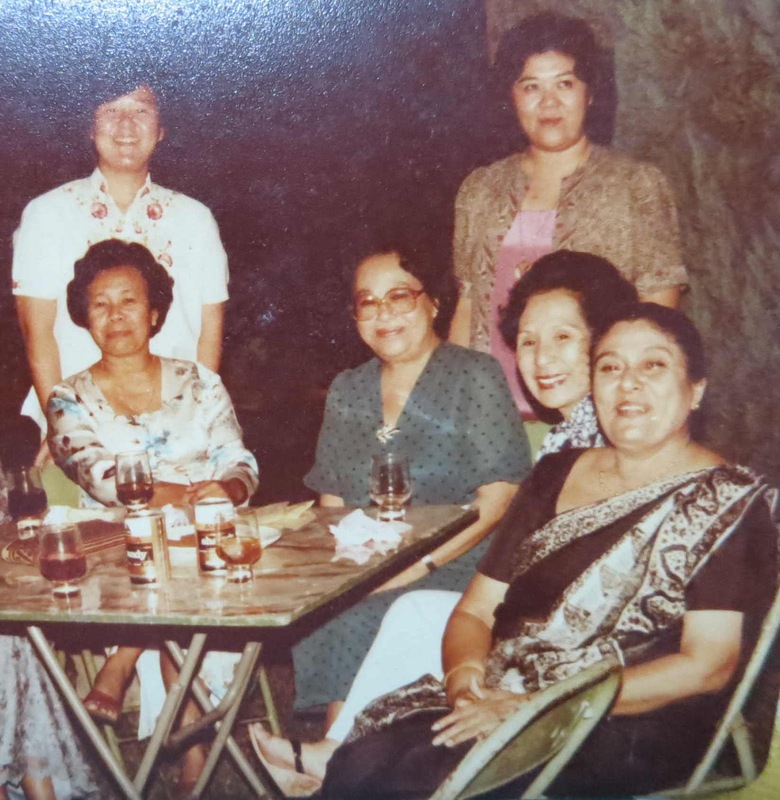 In 1995, just as she was poised to join the league of top academic professors in the international stage, she sacrificed her academic ambitions to be a full-time politician’s wife. 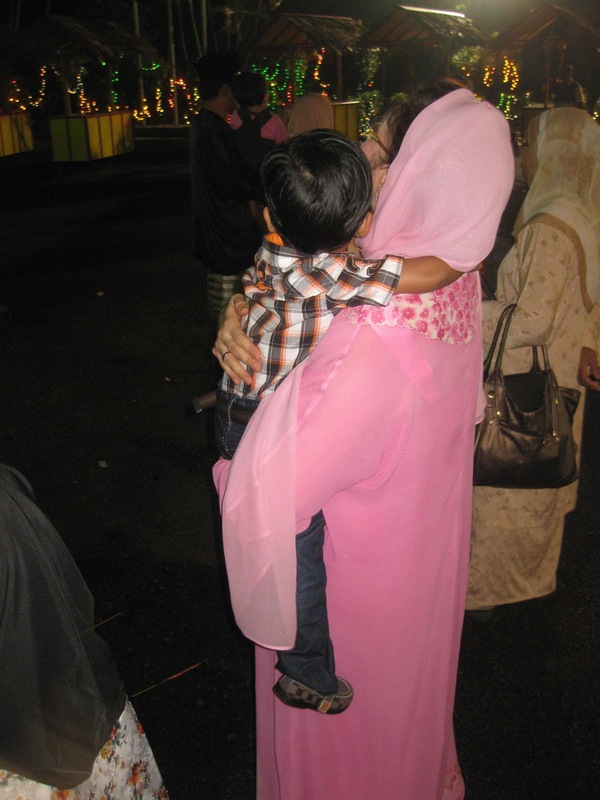 Even as she had to give up the icing on her academic cake, Prof Jamilah furthered her academic career with UTM as their first woman professor and applied her experience and expertise in the JUITA-ku Sayang projects in Johor as well as in the consultancy and research fields for UN Agencies and Federal Government ministries. As the Menteri Besar’s wife, Prof Jamilah is the President of JUITA, the acronym of Badan Amal Tenaga Isteri Wakil-wakil Rakyat Negeri Johor, an NGO actively involved in community welfare projects for women and children in Johor. With Prof Jamilah at the helm, 14 welfare projects has since been implemented in Johor to help needy single mothers, children and indigenous groups under “smart partnerships” in cooperation with State Departments, NGOs and the private sector. My previous experience with Prof Jamilah in APFAM laid the foundation for my understanding of her objectives and sentiments in the comprehensive projects by JUITA and it is now my privilege to work in partnership with JUITA to report on the good work they are doing for underprivileged and marginalized people. In December 2011, a book entitled, Perkongsian Bijak: Kejayaan Projek-projek Juita (Bersama Agensi-agensi Kerajaan Johor dan Pihak Swasta) Dalam Kebajikan (1996 – 2011), that recorded the achievements of JUITA in the last 16 years, was launched by Dato’ Seri Sharizat Abdul Jalil, when she was the Women, Family and Community Development Minister. This publication on the “Success of JUITA Welfare Projects through Smart Partnerships with Johor Government Agencies and the Private Sector” so impressed Shahrizat that she recommended it to be used as a guide in her Ministry and as a benchmark for other welfare activities. On Nov 8, Prof Jamilah’s latest book entitled, Seorang Professor dengan NGO JUITA or “A Professor and the JUITA NGO” was launched by Datin Seri Rosmah Mansor, wife of the Malaysian Prime Minister, to give readers a glimpse of how a professor applied her skills to lead a women’s NGO and successfully implemented a comprehensive range of welfare projects. The success of the JUITA-Ku Sayang projects can be attributed to the participation and commitment of the wives of Johor State Assemblymen and is indeed a legacy of Prof Jamilah’s foresight, passion and leadership. Working from concept to implementation of each project where help reaches the needy, Prof Jamilah has proved herself to be a woman with steely determination and a heart of gold. Congratulations Prof, on the launch of your new book and may your readers be inspired to follow in your footsteps to do more to help the needy in their communities! 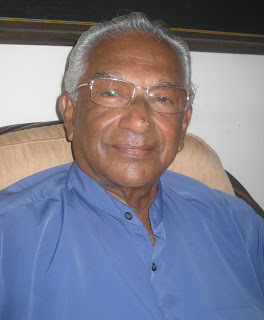 Anthony Fernandez is a retired teacher who will celebrate his 80th year on 19 November 2012. Happy Birthday, Uncle Tony! 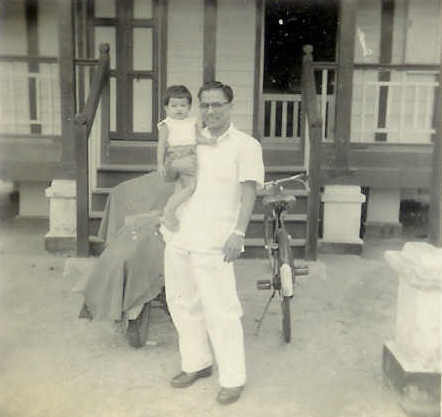 I was 14 years old when my father relocated our family from Kedah to Johor Baru. 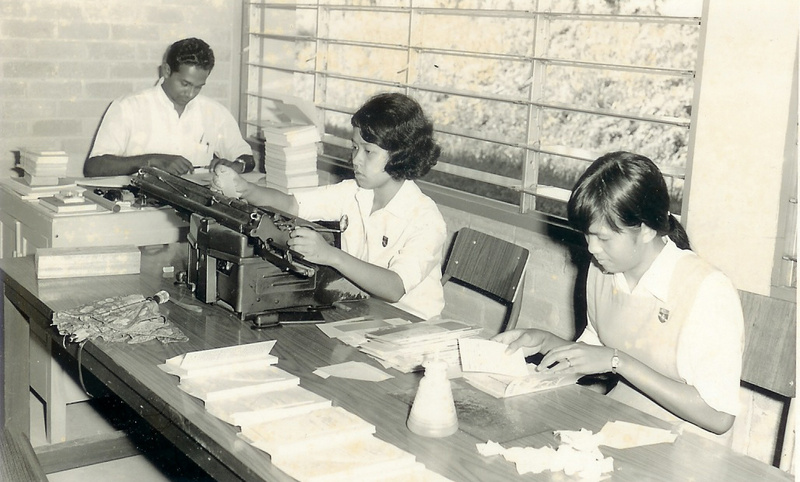 We arrived at Linden Estate, a rubber plantation in Skudai where he worked in 1946. 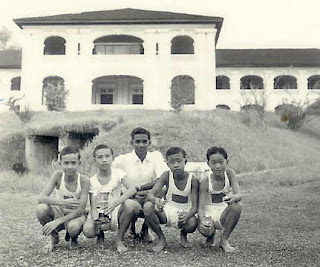 This plantation no longer exists today because the land is now occupied by the campus of the Universiti Teknologi Malaysia (UTM). 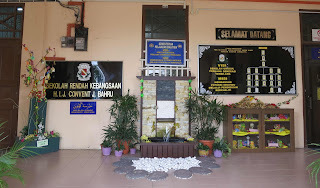 I went to Standard 5 in Bukit Zaharah School, a level equivalent to Form 1 at that time. From 1947 to 1952 I studied in the English College or Maktab Sultan Abu Bakar, as its known today, one of Johor Baru’s premier schools. 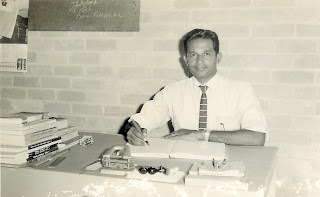 I was probably inspired by the exemplary standards of the teachers here because I had the ambition to become a teacher. In 1954, I was a trainee teacher posted to Bukit Zaharah School and besides teaching English I was also a Sports Master. I remember Tahir Onn, the uncle of Dato’ Seri Hishammuddin Tun Hussein, Minister of Home Affairs, one of the students in the photo taken with the team. Since joining the Photography Society in English College, Photography was my hobby and this photo was taken by my first camera, a Brownie. My first teaching post was with a vocational school known in the early days as the Trade School. While I was with this school from 1959 to 1979, the school name was changed three times in the 20 years. From Trade School, the name was changed to Secondary Trade School before finally being called Secondary Vocational School. I’m better known as Tony so students would call me Cikgu Tony. The subjects I taught was mainly English and Social Studies. I have a deep fondness for books so I enjoyed my role as the Librarian Teacher who supervised my assistants in helping to maintain the school library. I attend the oldest church in Johor Baru, the Church of Immaculate Conception, and was with this parish since I was 14. When the parish introduced laity in the church, I was one of the early lay-ministers who assisted the priests. Every now and then, I contribute articles to the Herald, a Catholic magazine. 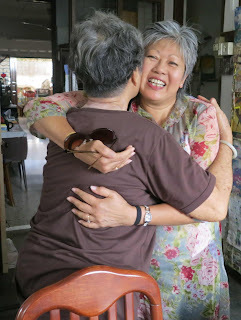 In a picnic at Pulau Bukom, Singapore, organized by a priest in 1962, I met Celine who became my wife in 1965. We have three children, two girls and a boy and are blessed with four grandchildren. With all the changes and re-development happening around us today, I often reminisce about the Johor Baru of yester-years – a small, quaint, quiet town that was centered around Jalan Ibrahim and Jalan Segget, where the bus terminal was located. My wife and I used to frequent the Chinatown food centre that bordered Johor Baru’s infamous Sungai Segget and we joined many food fans there to enjoy our favourite Teochew-style fried kuay teow with lots of cockles. Looking back now, I wonder if the filthy river ever dissuaded us from visiting the food centre but I guess the presence of the awful pong was very much part of the experience and everyone just accepted it! 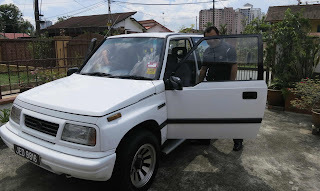 Our shopping was done along Jalan Ibrahim – for books by Han Su Yin and Somerset Maugham and magazines on psychiatry from Johor Central Book Store and imported cheese, jam and butter from Johor Cold Storage. I remember enjoying a range of good quality imported products, available only at this early style mini-market. And while we were at Jalan Ibrahim, we will always drop in at Ee H’ng for refreshing ice-kacang! For entertainment, we would watch movies at Capitol cinema – a theatre that is synonymous with James Ho. We watched a lot of movies there and I cannot forget “Zorro” the suave hero and Johnny Weissmuller in his role as Tarzan as well as the gorgeous Dorothy Lamour who wore a sarong in her role as Ulah, a female Tarzan! In 1979 I was transferred to a school in Felda Taib Andak in Kulai for 5 years before my next transfer to a Primary School in Senai as Supervisor for the next 5 years. It was interesting that my final posting before retirement in 1987 was to Sekolah Temenggong Abdul Rahman II, better known as STAR II. I realize that I had come full circle because STAR I and II located on Jalan Abdul Rahman Andak, were established to replace the former Bukit Zaharah School where started my career! Upon retirement, I taught English in a private college but I only managed 2 years of teaching because English teaching is very different now. I’m a product of the British education system and today my greatest disappointment as an English language teacher, is to see language standards plunge to such distressing depths. To keep myself fit, I walk a 5km route everyday in the area where I live in Jalan Kolam Air and when weather permits, I will walk around the nearby Merdeka Park. I spend my leisure time reading English literature like dramas and plays and am teaching myself to play the piano and guitar. To stay in touch with my eldest daughter and family in the United States, I talk to them through Skype and exchange emails regularly. I’m enjoying my retirement and coming from a generation where computers were unheard of – I’m coping well with modern technology and consider myself quite tech-savvy for an 80-year old. As I celebrate my 80th birthday on 19 November 2012, I wish to mark this occasion with a word of appreciation to my fellow teachers and former colleagues. It was my privilege to have worked with you and I wish all of you a Happy Retirement, good health and happiness in the years to come! In the past few months, I heard rumours about it from more than one source but last week, I received concrete proof that it was happening. My friend whose daughter is a student in the SK Infant Jesus Convent, Johor Baru, brought home a letter to her parents signed by the head of the school’s Parents-Teachers Association or PTA, dated Oct 30. The subject line reads: Perpindahan SK Infant Jesus Convent Johor Baru ke Nusajaya, which translates as, Transfer of SK Infant Jesus Convent Johor Baru to Nusajaya. I’m keenly interested in what's happening to my former school and took a closer look at the letter. 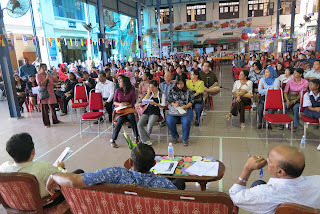 Apparently, all the PTA members of the 2012/2014 session have met, discussed and agreed unanimously for the school’s shift into a new school building in Nusajaya. In the letter, parents were also requested fill in their names and to indicate their agreement or disagreement to the move and return a tear-off slip to the school by Nov 8. This set off alarm bells because the concerned parents noticed a few inconsistencies in the letter. Firstly, it stated that a decision has already been reached by the PTA. But it also asked parents to say if they agreed or disagreed to the move. It appears that by a stroke of the pen, parents are going to add to the numbers to help the PIBG decide on whether or not to move the 800 primary school students to Nusajaya. But it is not such a simple decision because it will affect the lives of not only the students and teachers but also entire families. While Nusajaya may be the current hotbed for business development and education, parents and students still want the proud tradition of a Convent education in one of JB’s iconic landmarks, originally named, Convent of the Holy Infant Jesus. Since the deadline for the required reply stated in the letter was drawing close, parents urgently needed a clarification. And when a dialogue was arranged for parents to meet with PIBG representatives and the school headmistress, I did not hesitate to join them because it was an opportunity for me to confirm or quash the rumours. Incidentally, that morning the primary school also held its annual Hari Anugerah where Excellence Awards were presented to students who achieved commendable exam results. By observing and listening to the parents, my first impression was how they wanted their daughters to have continuity in completing their primary studies in SK IJ Convent, followed by secondary education in the adjacent SMK IJ Convent. These parents have made a personal choice to admit their daughters to IJ Convent and they share a sense of pride in giving their children a Convent education. In fact for the past 9 years a parent, whose business is in Pasir Gudang, rented a house in Jalan Mustaffa, a road directly opposite the JB Convent, so that his daughters could go to school conveniently. 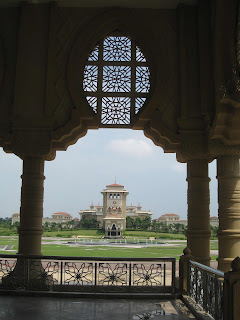 Just like him, parents who are aware of the quality education and the unique learning environment in the Convent, have made major decisions like selling their houses in the suburbs and buying homes closer to the school to enable their daughters to be educated here. Parents value the Convent identity, not only for its proud traditions in producing excellent students who have gone on to achieve reputable careers locally and abroad but also in continuing the legacy where generations of girls in their families have been educated in the only Convent school in JB. On their part, the school and PTA representatives acknowledged that their letter was poorly worded as it was meant to be a survey. They regretted the miscommunication and agreed to withdraw it, while seeking the parents’ help to draft a fresh survey form and appealed for volunteers to help authenticate the survey results later. The representatives assured parents that there would be a due process in the next few months and no decision has yet been made on the school’s transfer as it rests with the school administration and the Education Department. As I listened to the impassioned appeals to preserve the proud Convent heritage in JB, I understood that the parents do not want their daughters’ primary education to be disrupted. A parent said there are many schools in JB like Bandar Selesa 1 and 2 and Foon Yew 1 to 5, established one after another to comfortably accommodate their increasing number of students. If the Convent needed new premises for expansion, he suggested that they should establish SK IJ Convent 2 in Nusajaya for new admissions while the current students remained in the first SK IJ Convent JB. Built in the 1920’s, the buildings in SK IJ Convent has been renovated and extended to accommodate more and more school needs over the years. It is interesting that PTA head, Dato’ Awang Hj Omar seemed to emphasise that the school was beyond repair and some areas even posed a danger to students. But when I asked if they have applied to the Education Department for funds to upgrade the premises, he replied in the negative. From the views and sentiments shared at the dialogue, it is prudent and practical for the PIBG and school administration to take the next step in seeking a professional building survey to ascertain the costs involved for the preservation of the school in a heritage building. If this info is made available to the State Government, parents and the school alumni, who knows what they can do together for the project to preserve the IJ Convent primary school in its original premises? surprise arrival at tea time! My colleague, Jasmine, called to check if I have fallen off the face of the earth. She was probably wondering because I did not send any articles for publication. 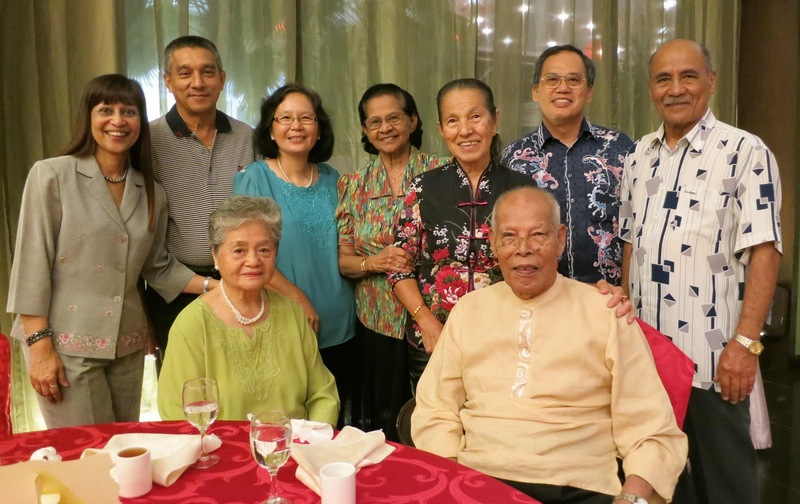 I told her I was taking a personal time-out to focus on my family as my siblings and I were planning a Thanksgiving celebration to commemorate our parents’ grand birthdays – dad’s 90th and mum’s 80th – and there was plenty to do to prepare for this event. Reassured that I was just preoccupied, Jasmine reminded me to share my family stories and she later sent a text that read: “You have a staunch following and your articles are a brilliant read.” This is very encouraging especially coming from a colleague whose guts, I very much admire because her forte is in crime reporting. It is certainly no bed of roses to work on horrific crime stories and thank you very much – I’m content with what I do. Ten years ago, we held a joint celebration for our parents’ birthdays so ten years on, we aimed to do it a little differently. In the early stages of our planning, Pearly, our second sister who lives in the UK, called to tell dad that she was unable to come. However two weeks before the event, she emailed her siblings to say that she has her flights booked and we started the countdown for her arrival – which we kept secret from our parents! 9 0 for dad and 8 0 for mum! It was difficult to keep such an exciting secret and once or twice, I caught myself before I let it slip during discussions about the coming event. Many years ago, we pulled off a similar surprise when I picked Pearly from the airport and had her phone dad at home from my mobile-phone and while they were still chatting, my sister walked into the house! Imagine dad’s surprise when he saw Pearly in front of him while he thought he was speaking to her in the UK! As we hugged this little secret to ourselves, we agreed that any tricks now may be too much of a shock for dad so we simply let Pearly walk in on our parents while they were seated at the table, having their daily afternoon tea! Needless to say, mum and dad were stunned and speechless with joy and they gamely joined in the fun to keep Pearly’s presence a secret from the extended family until the Thanksgiving dinner. In fact it was dad’s idea to have Pearly walk mum and dad into the banquet hall and give our guests a pleasant surprise. 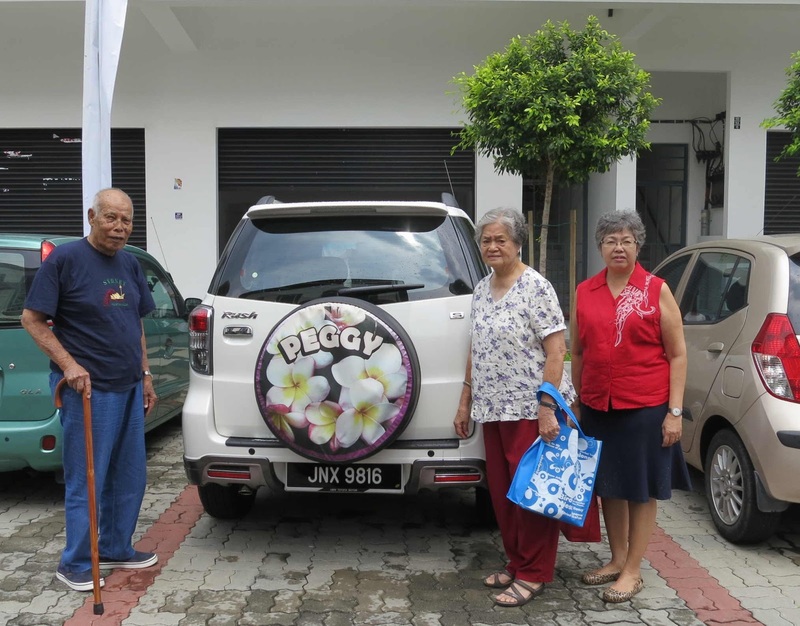 Meanwhile, our parents were in for another thrill because arrangements were privately made to ferry our 100-year old grandma to JB and have her in the hall when they arrived! It turned out to be a most memorable and meaningful evening shared among relatives, our church family and some of our parents’ former colleagues. 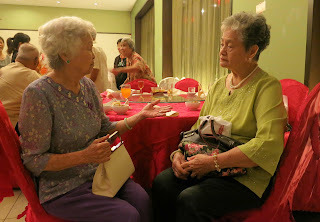 It was pure nostalgia as old friends and family members met in a special reunion and time of reminiscing over good food. With the help of modern technology, our nephews and nieces, who could not attend due to work and study commitments in Australia and the UK, sent their personal wishes to the grandparents through video recordings. The most unforgettable moments was when several church friends gave their tributes to mum and dad, recalling the early years when they first came to JB as young men in their 20’s. Among other things, they appreciated how mum, a former midwife, helped them when their babies were born. These children are now young adults with successful careers, some of them already married while several even have children of their own! Like our parents, the elderly among us are also advancing in age and it was very special for many of the senior folks to attend with the help of the younger generation. Mum shares a very special bond with her aunt [grandma’s sister] who is just four years older and I learnt that when they were younger, she used to sew dresses for mum. 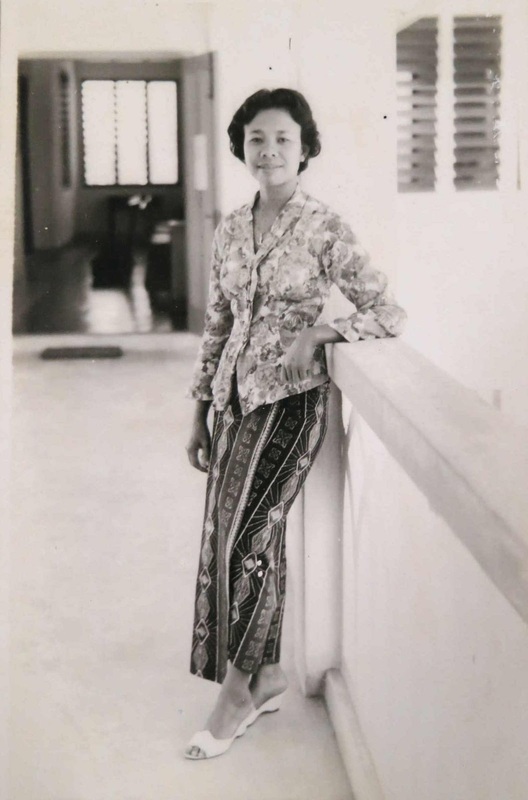 In fact, the evening gown which mum wore for her wedding banquet [held on the badminton court at 154, Jalan Ngee Heng!] was sewn by this grand-aunt. As they are about the same age, mum and her aunt started dating about the same time in the early 1950s. From dad’s collection of old photos, taken mostly at JB’s iconic Istana Gardens, I saw that the two couples – mum and dad and grand-aunt and grand-uncle – used to double-date. It was indeed, very special for these two couples, now older and wiser, to be together again at this joyous celebration! 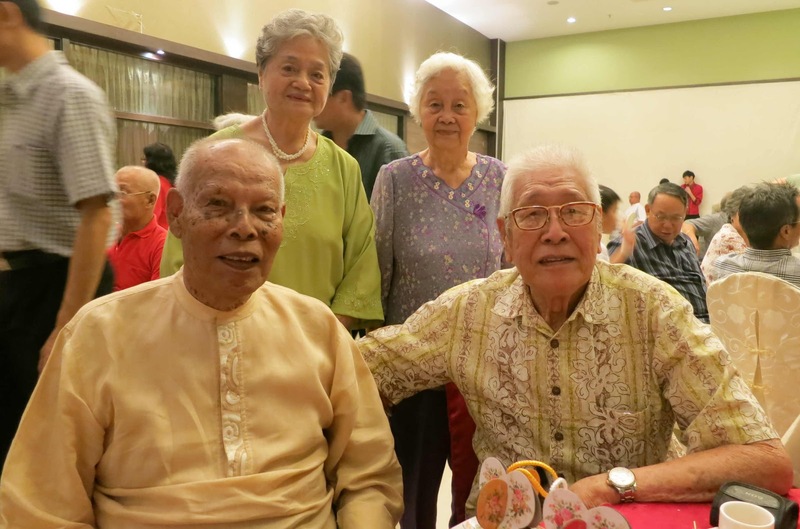 It was also meaningful for mum and dad to share this occasion with former colleagues, like Matron Tham Poh Choo, one of the trainers in Pupils Training School or PTS of the JB General Hospital in 1947. Also Cyril Clark, who first worked with dad in the JB General Hospital and later in Kota Tinggi Hospital – where my two older sisters were born. 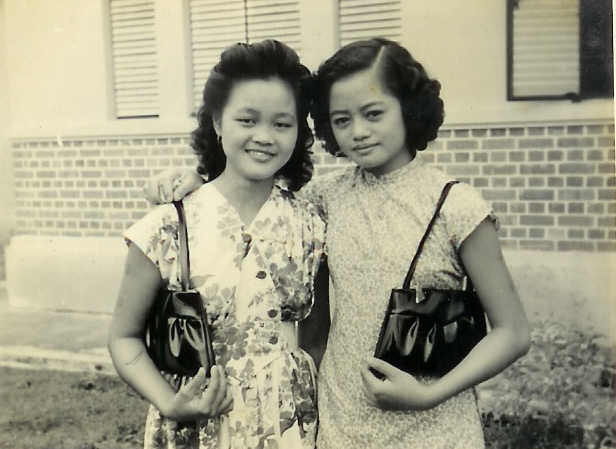 Nursing sister Wai Kwai May is no longer with us, but it was so thoughtful of her daughter, Grace and husband, Soon Hong, to come all the way from KL to join us. Words cannot fully describe how significant it is for our family to share our joy with dear friends and relatives as we honoured our parents in such a Thanksgiving. 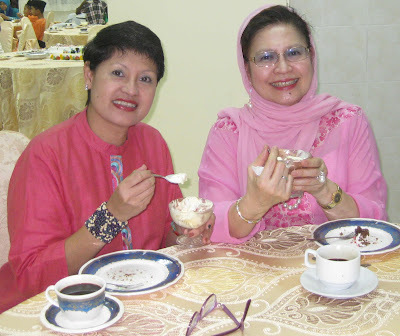 I trust our guests are as encouraged as I am by the decade-long bonds of friendship and our parents’ exemplary lives. To mum and dad, Happy Birthday to you both – and many more birthdays to come! It was our pleasure to be there at the birthday celebration. If I may say it, the Loh family has been consistent, caring and contributing to the Lord's work not only in JB but elsewhere too. The Lingam family has personally benefited from your kind deeds and thoughts. Though our visits to JBGC has become far and few, we continue to pray for the people there. Wow, Peggy, your article was so well-written I felt I was there with all of you!! But my oh my, thank God you didn't give your mum and dad a heart attack with Pearly's trick!! Yes, Happy Birthday to your mum and dad and many more birthdays to come! !